Now available in all book stores "The Conquest of the East"
When Chanakya was born he had a full set of teeth, which is a sign that he would become a King or an emperor. But since he was born in a Brahmin family, it was considered inappropriate. Thus, his teeth were broken and it was predicted that he would make another person a king and rule through him. Even as a child, Chanakya had the qualities of a born leader. He became a RajaGuru and not a Rajah. The same way Chanakya’s death is shrouded in mystery. He was the guiding force behind Chandragupta and the vital person who made him an able Emperor. Chanakya adds poison in little amounts daily in Chandragupta's food in order to make him immune to poison, lest some enemy tries to poison him. However Chandragupta was unaware about this and once gave a little food to his wife who was in the ninth month of pregnancy. She didn't survive but Chanakya cut open her belly and took out the baby. The baby was born with a dot in his forehead due to the poison. He came to be known as Bindu (dot) Sara and became an Emperor after Chandragupta. He had a minister named Subandhu who did not like Chanakya. 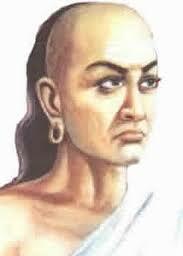 He told Bindusara that Chanakya had killed his mother. Without assessing facts, Bindusara confronted Chanakya. On knowing the whole story, he felt ashamed at his hasty actions and begged for forgiveness. He asked Subandhu to go and apologize and make Chanakya come back.